Malta is a city surrounded by water. This is a phrase you hear time and again, whether as a local or visiting the islands. It’s used in both positive and negative ways. Let’s start with some facts, and then see what Malta, the city state, not just the island state means. Certainly, Malta is urban and has a heavy population density for its 316km square size: it has around 1,200 people per square kilometer (3,000 per square mile). It is the EU’s most densely-populated country. Which means you’re up pretty up close and personal to your neighbours; and all the more so in peak summer, when there’s huge people pressure on beaches and in bars. We take a look at what the cheek-by-jowl nature of Malta means. 1. You can find a lot going on outside your door without having to travel far. For instance, there’s a vibrant, city-style arts, music, clubbing, and cultural scene within around a 15 minute car journey for most people. You can be as rural as Malta can get, and then be in the ‘Golden Mile’ of St Julian’s entertainment and nightlife hub within half an hour of deciding to go out for the night. The beach is only around 15 minutes away too! 2. You’re likely to meet someone you know, even if you go out alone. Whether you go to an event, the beach or shopping, it’s almost impossible to do so without meeting someone who at least has a passing knowledge of who you are. This can have negative aspects too of course, as you might have wished for some time out in peace, or to go somewhere surreptiously/incognito. In most cities, you wouldn’t often bump into someone you know, but Malta is village life writ large living next door to trappings of a city – five-star hotels, upscale restaurants, swish yacht marinas and so on. 3. The juxtaposition of new and old, the beautiful and the ugly. As our photo shows, these pairs sit side by side, literally, in Malta. 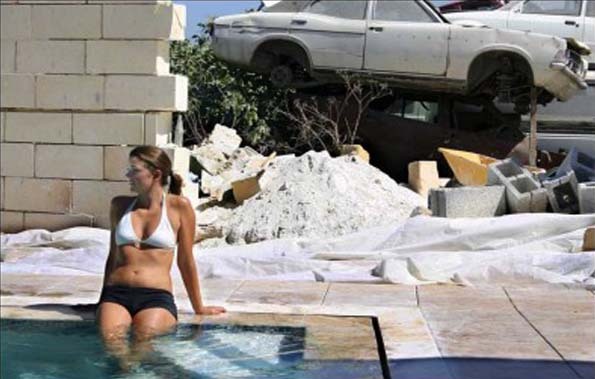 If you embellish your house or flat, you really do have to look very closely at ‘location, location, location’ as you may easily have a car scrapyard just over the wall, as above. When holidaying in larger countries, you can usually cherry pick the picturesque/historic bits to see, avoiding ugly industrial areas; in Malta you can’t. As tiny islands, confined by their watery barrier, there’s no hiding the ugly bits from most people’s view. As a country, it has to have its complement of mess – the industrial zones, power station and urban sprawl – all fairly near to the parts that are postcard pretty. But Malta is beginning to revamp the ugly: until relatively recently, a man-made mountain of rubbish featured all too prominently as a blot on the landscape. Thanks to EU funds, it’s being turned into a natural park! 4. Noise (pollution)- enough said, but see our post ‘Big Bangs‘. 5. Love thy neighbour takes on a new meaning in Malta. We doubt you’ll always love them when you’re this close in space. A friend of mine suffers summer with her neighbours watching TV in their back yard – yes, they carry it out, blasting out noise, as it’s too hot inside the house to watch in comfort. Conversely, neighbours can and do watch out for each other in a positive ways as well, especially in villages. 6. You can see the main historical sites and beauty spots on a day trip (as cruise liner passengers do). Nowhere is really far from anywhere, which means short-stay visitors can pack it in. You’ll all have your own experiences of the two faces of Malta! Feel free to add a comment to enrich this post.